Hotel La Richelle, Amsterdam discount hotels and accommodation. 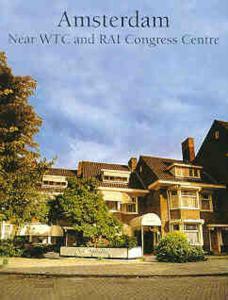 Hotel La Richelle is situated in the 'Old Chic" of Amsterdam, close to the RAI Congress and Exhibition Centre. The hotel is easily reachable as it is approximately 10 minutes from the city centre and there is ample parking space available. Hotel La Richelle is situated in a residential area. The hotel doesn't have a regulated aircosystem. Of course all rooms have toilet, bath/shower, hair dryer, cable TV and modem. Couturiers, delicatessen, cafe's, bistro's and restaurants with international kitchens are within walking distance. View photos, room descriptions and make online reservations at Hotel La Richelle. Save on room prices at Hotel La Richelle, Amsterdam.